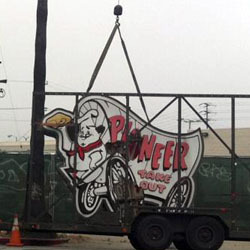 Pioneer Pete is no longer riding his chuckwagon over Silver Lake. 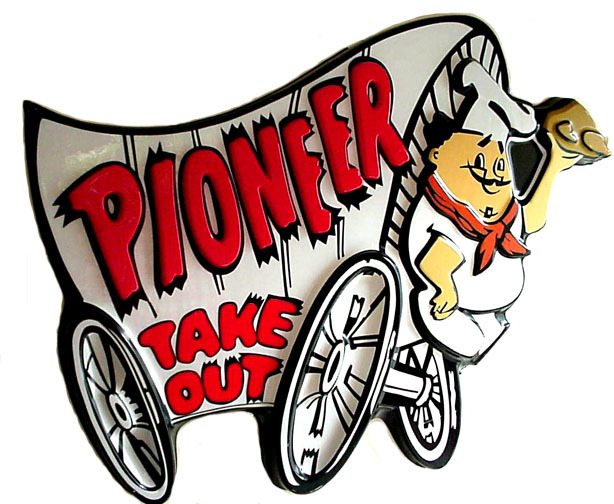 The once ubiquitous Pioneer Chicken chain is now reduced to three locations in Los Angeles. The Sunset and Fountain Store is about to reopen as a Del Taco and the old sign came down this week. Los Angeles is the birthplace of fast food and we continue to devour it even as the landmarks of that era fade away. Former Naval officer H.R. Kaufman opened the first Pioneer Take Out at Sunset and Echo Park in 1961 after giving up on a dream of opening a shoe shine stand. By the time the chain imploded in 1988 there were 300 Pioneers from Phoenix to Hawaii. There was a big celebration when the Silver Lake store opened on July 10, 1979 with a “Chicken in the Basket” special going for .59 cents. You can still get that dish at the San Vicente and Olympic location for $6.50.